The little gymnast squirrel was at my feeders the other day. Hanging upside down by his hind legs and eating the seed from the feeder. Then yesterday, I was cooking dinner and looked out the window. 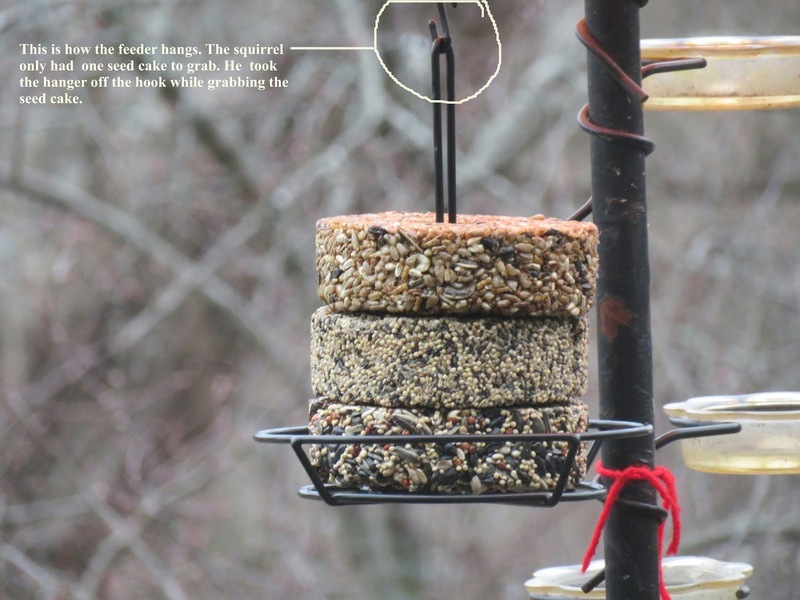 That squirrel was on the round feeder that has a donut type shaped seed cake. You slip the cake over the center pole and down to rest in the base. Somehow, as I watched, he flipped the hanger off the hook grabbed the seed cake as the hanger was falling to the ground 10-12ft below. He made a mad dash as I was yelling! I let the dogs out! The squirrel ran to the top of the Pin Oak tree, my dogs barking down below. Picture opportunity! Ran and got the camera. The squirrel was on the move and real quick! No picture could I take. He jumped from the Pin Oak branch to the Black Haw which was about 10 feet and down from his position. Leaped over to the flowering crab, went down the trunk and lickity split went across the yard to the Cottonwood tree. If you would have blinked you would have missed the action! I didn't know they were that fast! Maybe they should have squirrel Olympics. Gymnast and hurdles and foot races could be on the program! 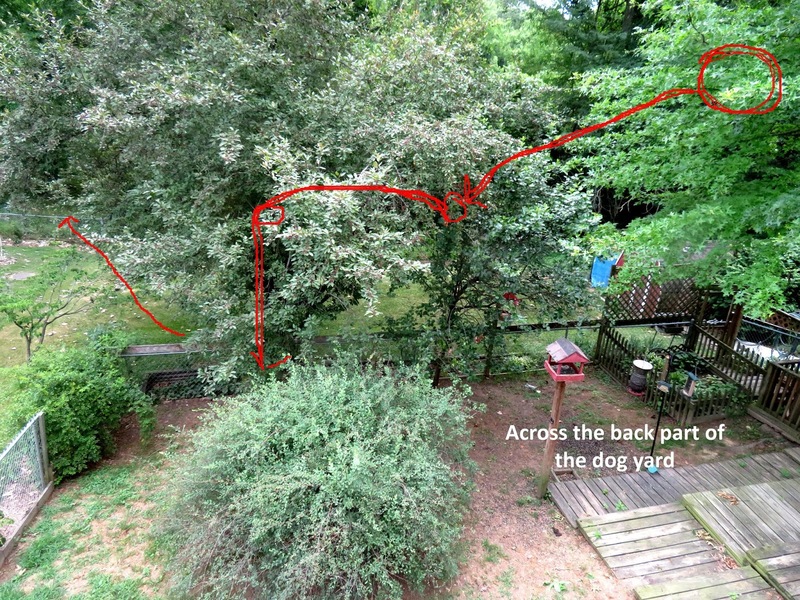 I will attempt to show you in a previous picture of the yard where the critter jumped to. Guess you can't reed on the picture. The "S" hook is what the feeder hangs on. 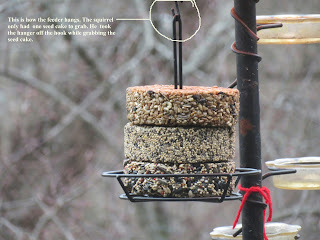 This is not where the feeder is hanging now but it shows the feeder good. below. The squirrel took off! 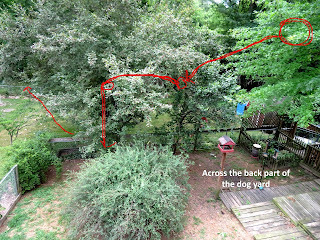 Hopefully you can see part of the route the squirrel took. The Pin Oak he was in is pretty tall. A young tree but tall. get the idea. From the dog fence to the Cottonwood I would say 25' maybe.